If you're a fan of comfort dressing when it comes to your personal style, you'll love this cute pairing of a beige shawl cardigan and a Shinola birdy leather foldover clutch from Nordstrom. Play down the casualness of your outfit with black suede wedge ankle boots. 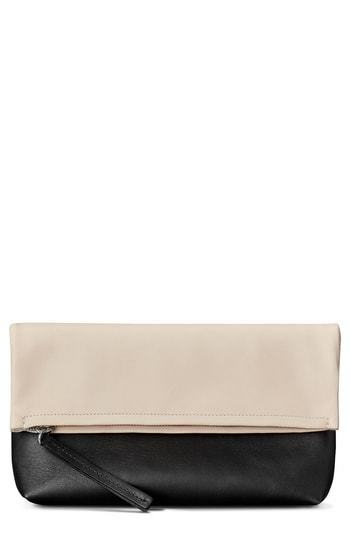 Wear a black blazer with a black and white leather clutch to be both casual and killer. You could perhaps get a little creative when it comes to footwear and spruce up your ensemble with pink leopard leather pumps. We're all seeking comfort when it comes to dressing up, and this combination of a black skater dress and a Shinola birdy leather foldover clutch is a perfect example of that. Kick up the cool of your outfit by rounding it off with white and black leather ballerina shoes. We all outfit for comfort when it comes to dressing up, and this combination of a mint coat and a Shinola birdy leather foldover clutch is a good illustration of that. Up the cool of your outfit by finishing off with gold leather heeled sandals. We're all seeking comfort when it comes to dressing up, and this combination of a white and black cable sweater and a black and white leather clutch is a perfect example of that. For footwear, go down the classic route with black leather ankle boots. If you're obsessed with relaxed dressing when it comes to fashion, you'll love this super cute combination of a black leather bomber jacket and a black and white leather clutch. You could perhaps get a little creative when it comes to footwear and elevate your getup with white leather pumps. If you’re a jeans-and-a-tee kind of gal, you'll like the simple combo of a tan crew-neck sweater and a Shinola birdy leather foldover clutch. For footwear, go down the classic route with navy suede pumps. Consider wearing a yellow blazer and a black and white leather clutch, if you want to dress for comfort without looking like a slob. Wearing a pair of white and black leather heeled sandals is a simple way to add some flair to your look. If you're all about feeling relaxed when it comes to dressing up, this combination of a beige leopard fur coat and a Shinola birdy leather foldover clutch from Nordstrom is just for you. Dress up this outfit with black leather pumps.